School officials are shocked, shocked to find that hazing is going on in a fraternity. Last month, a Kent State frat was suspended by the school for three years after an investigation revealed they had conducted frat-like activities. The official term is "hazing." "Kappa Alpha Psi Fraternity received the notice on October 7," reported Fox8.com on Oct. 30, "The three-year suspension was effective immediately. The notice states that the allegations of hazing were brought to the university's attention on August 27." Now, documents recently released to some media outlets via a public records request (tip of the hat to the Akron Beacon Journal) gives a better picture of what happened to Kappa Alpha Psi, the predominantly black fraternity that became Kent State's first black organization on campus in 1949, according to the ABJ. The school sent those documents to Scene this afternoon after we asked for everything already provided to any media. The Kappas have not adhered to their own standards nor the university's guidelines pertaining to recruiting new members. 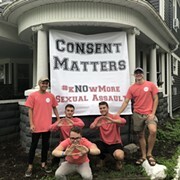 Over the last several years, the Kappas have been investigated, sanctioned, and given numerous opportunities to seek out resources that could improve their standing as an organization. Unfortunately the Kappas have either not sought out assistance and/or they have not taken advantage of advisement and continue to abandon expectations. There has only been circumstantial evidence of hazing through physical violence (paddling/caning) and mental anguish (unsanctioned and inappropriate activities including running errands) made available to the CSI investigation committee. Again, the physical violence: "paddling/caning." The mental anguish: "unsanctioned and inappropriate activities including running errands." That sounds an awful lot like a frat. Much of the letter regarding the investigation initiated by Dr. Rashid is blacked out, likely because it contains student-identifying information exempt from disclosure by FERPA, so we still don't know everything the school knows. But the parts not blacked out show that a Kent State police detective relaying that the department was contacted by a woman (her name and what she reported was redacted) on Aug. 24. Three days after, both Rashid and Charles Dawson, the regional director of the national Kappa Alpha Psi, sent cease and desist letters to student leader of the Kent State chapter (embedded below). The letter shows that between Sept 16-19, the school's investigators met with one female and two male students. The entire sections detailing those meetings are redacted (only their title — Ms. or Mr.— and the date weren't blacked out), but they presumably document the specific allegations of frat-like activity by the frat. The fact they are redacted in its entirety likely means some good, specific and identifying stuff was in there, but it's possible it just contained rumors or weak evidence against them (Kappa Alpha Psi does not have an on-campus house). "They (Kappa Alpha Psi members) are still students on campus, but can no longer operate as a fraternity," explained Mansfield. "They can't reserve a room for a meeting, they can't take part in fairs or other activities. They can't hold functions on campus, they no longer exist as far as being a student organization on campus now that they have been suspended." The Fraternity has not only outlawed pledging, but bans from its membership those who submit to such a vile process and the Fraternity’s membership intake process is the sole method for obtaining membership in the organization and said process is designed specifically to attract and retain members of high academic, moral, social, civic, ethical and religious standards. Some wayward members of the Fraternity, who do not subscribe to our motto of achievement, have elected, in open defiance of the rules and regulations of the Fraternity, to conduct underground pledging and engage in acts of hazing and other Prohibited Acts in clear violation of Fraternity rules and criminal statutes of the various states. Such members’ criminal behavior is repugnant to all for which the Fraternity stands and such members are renegades, not wanted, and clearly deserve, because of their behavior, to forfeit their membership in Kappa Alpha Psi Fraternity. The cease and desist letters sent by the regional leader of the fraternity to the Kent State chapter also seems to show they do take it seriously, on paper. The news clip shows members of another Kent State frat, Kappa Sigma, saying all the right things to the camera about what they do. They are "frustrated by the stereotype some people have of fraternities and sororities." *Kappa Sigma brother Luke Marzec: "It's a lot more than, you know, guys all getting together and binge drinking and doing stupid things." *Unnamed brother in the Kappa Sigma house wearing a backwards hat and Kappa Sigma hooded sweatshirt: "We require our members to have 35 hours of service each year." *Kappa Sigma brother Christian Eulinberg: "We believe that hazing is the lowest form of cowardice, so you wouldn't haze your friends so why would you haze, like, a brother, someone who is trying to become a member of your organization." The reporter introduces Eulinberg's next soundbite: "the punishment does not surprise members of other fraternities who don't want the Greek community to have a bad reputation." Eulinberg: "We all want to be respected in a certain light, we all want everyone to respect us." *The brothers at the Kappa Sigma chapter at Georgia College & State University forced pledges to clean their house, yelled at them when they got frat trivia wrong, rousted them out of bed to run errands for them and buy them gas, and were blindfolded and taken into a field at 3 a.m. ("they were pulled through briars and made to stand on a plank and recite fraternity information") (link). *A freshman Kappa Sigma pledge at the University of Miami died after getting drunk and trying to swim across a lake in a hazing ritual and the frat was later suspended for four years for unrelated incidents (link). *A story by the student paper at Denison published last week starts off: "Four months after going through a previous hazing investigation, the Kappa Sigma fraternity is once again facing hazing allegation" (link). *The University of Alabama last fall "canceled all interfraternity Council pledge activities after an investigation of numerous hazing allegations involving several fraternities," including specific allegations against Kappa Sigma" (link). *At the University of Louisiana at Monroe, as of Oct. 3, "the Kappa Sigma fraternity is under investigation for hazing and has been suspended" (link). Those are just some of the recent hazing stories on the first two pages of a google search for the fraternity that issued soundbites to the Fox8 camera stating their chapter does not haze. I could go on with more examples of hazing, but we both have things to do, so just read "Confessions of an Ivy League Frat Boy: Inside Dartmouth's Hazing Abuses" in Rolling Stone, "When a Hazing Goes Very Wrong" in the New York Times, and "A Fraternity Hazing Gone Wrong" by NPR. Denials of hazing by guys in the standard fratty frat have to be taken with a grain of salt. The official anti-hazing policies from the national chapters read like they are written by lawyers simply to lower cost of the frat's insurance coverage and to limit their liability in wrongful death lawsuits for when pledges inevitably die from alcohol poisoning after downing a case of Busch Light and a handle of Popov in an attempt to win the favor of some senior house leader named Chad who wears pastel shorts and boat shoes. Like the "NO DRINKING IF UNDER 21" signs taped on frat house walls across America, the anti-hazing policies are there just to have something to point to when things ultimately turn bad. Same with any university's anti-hazing policies: they don't want to be sued. Kappa Alpha Psi bit the bullet at Kent State last month at Kent. Who knows what frat will be next; it could be any, really. Perhaps one day the kids who would've entered the Greek system won't be able to have their "brothers" strategically picked for them by upperclassmen based on their willingness to participate in elephant walks, or naked Icy Hot rub downs and testicle-whips.